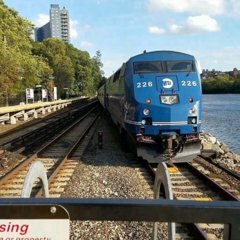 The MTA has awarded a base contract for 33 R188's for the Flushing line. The order includes 23 standard R188's, and 10 converted R142A's. The contract total is more than $87 Million. Kawasaki will convert the cab (A cars) within it's Yonkers facility. The B cars will be converted jointly with the MTA, at the 207th Street Overhaul Shop. R142(46 eleven car set inserts) - The R142A is a 10 car train set. Therefore the 11th car will be added to each set to make a converted R188 or R142C. The first conversion set is to be completed by this time next year. R188(10 eleven car sets) - Delivery is slated for the 4th quarter of 2012. These 23 cars, will make up 2 new 11 car trains. The 23rd car will be inserted with a converted R142A. MTA also holds options for an additional 473 cars. (123 new cars, and 350 R142A converted cars.) The option contract is already set to be awarded, as previously mentioned in another thread. What is the fate of the R62As on the ? When will that be confirmed? yes! Cant wait for it to happen. I was expecting the R142's & R188's to combine as is being R142A 5 cars - R188 middle car - R142A 5 cars to make an 11 car set. Now a message to everyone: get your RFW shots of the before theres no more RFW! I think a few R62A's are going to stay on the . most of them will go to the (hopefully b/c the LEDs on those cars would be a big help). I thought that R62A train using cars from the was staying there. I guess no R62A's from the are going to the . Dont know when it will be confirmed. well just have to wait and see what the says. :tup:R142A's to the :tdown:no more RFW. The MTA has already awarded a base contract for 33 R188's for the Flushing line. The order includes 23 standard R188's, and 10 converted R142A's. The contract total is more than $87 Million. R142(46 eleven car set inserts) - The R142A is a 10 car train set. Therefore the 11th car will be added to each set to make a converted R188 or R142C. R188(10 eleven car sets) - Delivery is slated for the 4th quarter of 2011. These 23 cars, will make up 2 new 11 car trains. The 23rd car will be inserted with a converted R142A. Why do they even need to convert R142s to begin with? I know why (because of 10 car vs 11 car issue), but what I'm getting at is aren't they going to be taking R142s from the 4 5 6 lines? I mean converting those cars wouldn't create any sort of shortage on the busiest line in the subway system? They will slowly be displaced as the entire R188/R142C order will go to the line. I dont have a clue as to what line the 62's will go to. I'm still learning which lines use what trains! Why would they put R62s on the 6 line when my understanding was that they were planning on putting a high tech signal system in place along the 4 5 6 line so that they could add more trains thus reducing crowding? The 4/5/6 already has ATS. Actually ATS is a problem within it self because when it screws up the whole Lex becomes a log jam. If they put R62As back on the ATS will still work. Reduced crowing on the Lex 4/5/6 is something you will never see as long as the Second Av Subway is never built. Is ATS part of the reason that the local 6 train is often quicker than the 4 and 5 express? I mean sometimes they say there's train traffic and I'm thinking that isn't possible because I've been waiting a good bit for a train (considering it's the 4 5 6 line) so how could there be train traffic ahead? I won't debate that at all... This is what I heard from the MTA and why they implemented ATS with the goal of reducing crowding since you could squeeze more trains in on those lines and have less spacing between the trains. They're going to be taking the R142As from the 6, adding one car, and adding a CBTC system onto it. The signal system is not reliant on any on-board train system, so it will still work. The 6 has always been quicker then the 4/5 imo. The 4/5 have to deal with each other at the Rogers Av Junction where 5s split off to Flatbush, and also when 5s terminate at Bowling Green when 5s have to dump and then rejoin on the northbound side. Then again after 149th Street where 5s join the Lex into 138 Street and into 149th Street lower level. The 4/5 are frequent lines and all it take is for someone to hold a door and you have a problem. There isnt much room for error on the Lex Express even with ATS. When ATS has a problem the Lex turns into a nightmare, which is why I think it was better with the old signal system. This has nothing to do with the 'politics' of the UES. If those riders don't like to ride the old cars, then they can take the bus to the West side or try their luck with the taxies. They should be fortunate to have anything serving them. Now what I still wonder is if they will link those single R62A cars into 5-car sets. Then again at least maybe there will be rfws again on the Pelham line. Unrelated: I still think the MTA should think about using 60' IRT cars [as long as the R143/R160s but narrow like the R142s]. Why go thru this hassle over the 11th car? I mean is Steinway that much of a problem that cars can't be longer than 51' long? Id imagine the R62As will return to the and since those are where the R142A's are. Well I'm guessing since it's the 142As being modified, all of them will have the first option you listed. Do you think the 188's will have the same sound too then? Probably. If they want compatibility across the board, they'd better have the same propulsion system. That test 142-142A thing didn't work out so well from what I remember. My question is.With the R142A being converted at 207th st,will the Put a rebuilder plate to replace Kawasaki`s,like they did back during the GOH (1985-1992)? You are correct sir.With the R142A bucking and the R142 slow motors made a recipe for fail.Basically Kawasaki is doing a overhaul project.I know they are going to get back the 142A Back at yonkers and say "What? you again!!!" THey probably won't bother with the plate. All they have to do is add a few parts. They're going to be installing a CBTC system on the 7, and these are the cars that can use the system with modification.